Karyn Lewis is an illustrator, writer, knitter, crafter, mom and wife. 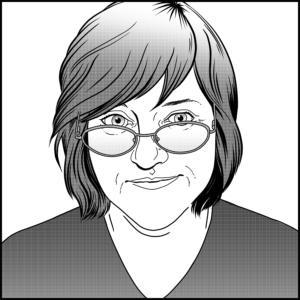 She received a Bachelor of Fine Arts degree in drawing from Colorado State University, and worked in the newspaper industry for a number of years before focusing her attention on her freelance career. She currently lives in South Bend, Indiana, with her husband, Jeremy, and their son, William, as well as a dog, a cat and two rescued rats. To keep up to date on her latest projects, please subscribe to Karyn’s newsletter, which will be sent to you whenever there is new art in the illustration gallery or books on Amazon. Managed through Mail Chimp, you won’t be spammed, and can unsubscribe at any time.